Sen. David Perdue (R-Ga.) was seen on video snatching the out of the hands of a Georgia Tech student while he was being asked a question regarding the state's possible suppression of minority voter registration. Perdue was visiting the college campus in Atlanta on Saturday to campaign for Georgia's Secretary of State Brian Kemp, The Washington Post reported Sunday. Kemp is being sued by the Georgia NAACP over a report that more than 53,000 voter applications from a majority of black voters are on hold just a month before the general elections. Kemp, a Republican, is in a statistical tie in the race for Georgia governor against Democrat Stacey Abrams, according to a poll released this week. 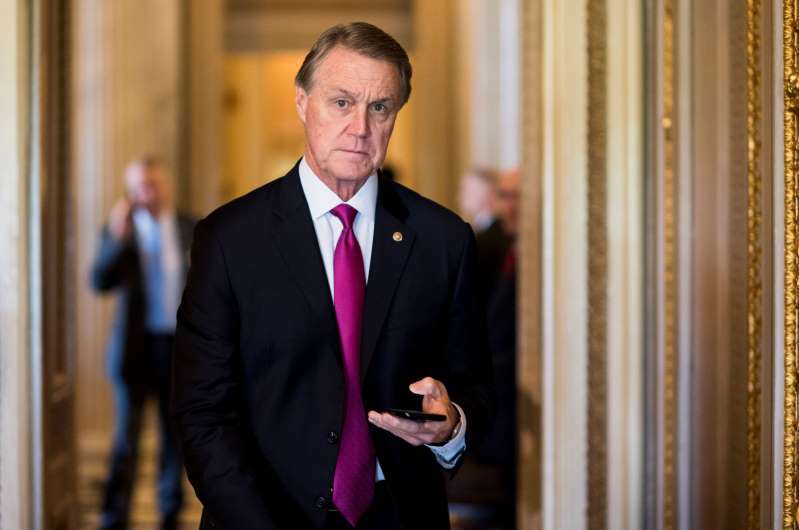 An unnamed student member of the Young Democratic Socialists of America on Saturday confronted Perdue about Kemp while recording the senator on his cellphone, according to the Post. The student was in the middle of asking Perdue a question apparently regarding his support for the gubernatorial candidate when Perdue interrupted him. "Hey, so, uh, how can you endorse a candidate - " the student can be heard saying, before the video begins to shake and Perdue says, "I'm not doing that." "You stole my property," the student tells Perdue. "You stole my property." "Alright, you wanted a picture?" the senator replies. "Give me my phone back, senator," the student says. Perdue appears to ignore the student's request and repeats, "You wanted a picture?" The student again asks for his phone back and the video corrects itself. Perdue is then seen walking away through a crowd. "That's U.S. Senator David Perdue. U.S. Senator David Perdue just snatched my phone because he won't answer a question from one of his constituents," the student says as he appears to make an effort to follow the senator. "He's trying to leave," the student continues. "He's trying to leave because he won't answer why he's endorsing a candidate who's trying to purge people from voting on the basis of their race." The Hill has reached out to Perdue's office for comment. The student requested to the Washington Post that he not be named out of fear of retaliation. The newspaper confirmed that he is a Georgia Tech student and is considering filing a report with campus police. The Young Democratic Socialists of American at Georgia Tech told the Post in a statement that they believe Perdue accidentally stopped and restarted the recording while he was hiding the phone from the student. "Perdue walked into Georgia Tech's backyard, and students aren't allowed to ask him a simple question?" the group stated. "It would be one thing to say 'no comment' or inform us he's not taking questions. Perdue would have been within his legal rights to simply walk away or decline the question. But instead, he forcibly, suddenly, and violently took their phone without justification or provocation." The group said in the statement that the Georgia Tech student would have likely been arrested "on the spot" had the roles been reversed. "This behavior is shocking, appalling, and totally unbecoming of the supposedly hallowed office of U.S. senator," the group said.